When we left you yesterday, we were on our way to do a hike to the top of the Plateau. The campground is located near the entrance and administration building, and we had to walk up past the restaurant and chalets to get to the trailhead. It's not really far, but it was uphill and even at 9:30am it was starting to get warm already! The main campground. Our site is actually in the opposite direction, and well secluded from any other campers. Just the way we like it! Each campsite has a braai (charcoal BBQ grill), a water tap, and an electrical post with a light. Wouldn't you know, we got all set up and then found out our electrical post isn't working! We usually know better than that and of course next time we'll check the outlets before getting set up. No worries anyhow, we only need electric for our laptops, and we brought a small inverter to use the truck battery, so we stayed put. Our supplied fridge/coolbox operates only off 12v electric and the truck has a separate battery for that. On the trail, we made a wrong turn and ended up doing an additional 20 minute loop section. We came across an old German grave. Apparently this park used to be a farm prior to the 1970's. The entire plateau above the campground and resort is also park property and apparently there are giraffes and rhinos up there. You have to have a permit and pay to go on safari up there, so we won't be doing that here. We'll be spending the next six days in Etosha National Park and we'll be seeing lots of wildlife there! Kevin, just climbed up a "ladder"! The trail is rocky and steep at places, but as one older gentleman said who was coming down "it's rocky, but even the old people can do it." Good for him! Us, at the top of the plateau. A few others enjoying the view with us. We met a nice German couple at the top of the plateau. Most of the other tourists we've met have been German, but there are some British here as well, and we heard a family who sounded like they were from Bulgaria or some place in that region. Not sure. However we haven't met anyone else from North America yet. 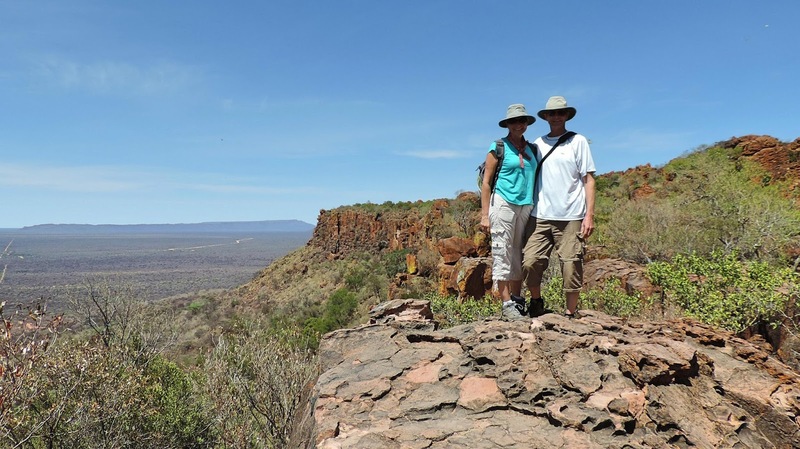 The view from the top of Waterberg plateau. Near the bottom of the picture you can see some of the chalet buildings. Notice how the bottom includes more greenery. There is an underground spring here which is what attracted people to the area many years ago in the first place. Namibia is in the middle of what they are saying is the worst drought in 30 years but the underground spring continues to flow. Some of the chalets that are for rent. There is also a restaurant on site for meals. It was around 12 noon when we made it back to our campsite, and it was getting warm. We had some lunch, and I tried to have a nap, but it was too hot inside the tent. We don't have a thermometer, but we think it was about 34C (94F). Not very humid though...it is very dry here. Anyhow, we figured our afternoon was better spent by the pool! Ruth, going for a dip. It was much nicer in the shade by the pool. We stayed for a couple of hours and just relaxed and watched the occasional baboon wander by. At one point a few of them came by and played for a while. Some people consider the baboons to be pests, but we like watching them and haven't had any problems with them. We noticed that some tourists try and get too close to them though. And some try to scare them off even though they're not bothering anybody. We can't quite figure that out. As in most cases, people tend to cause their own problems. They cautiously came over to get a drink from the pool! 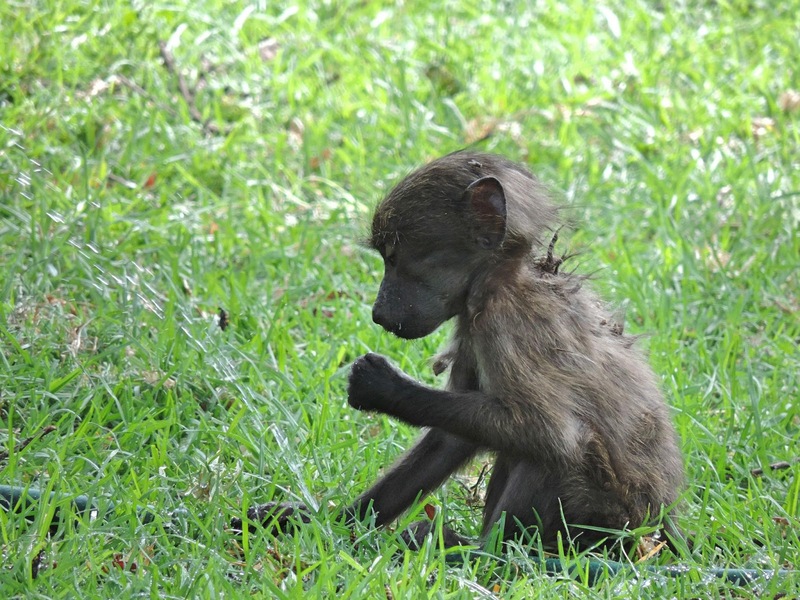 The baby baboon found a leaking waterhose and was having fun playing with the water and trying to drink from it. A group of very loud tourists came to the pool around 4:00pm so it was about time for us to head back to the campsite for a cold drink. We did roast chicken on the braii (charcoal grill) with veggies and rice. Then in bed by 9:00pm. We find it makes much more sense to go to bed early and get up early. We were up this morning at 5:50am, just before sunrise. Taken through the bushed at our campsite, this is a dik-dik. One of the smallest antelope species, they stand about a foot tall! Ha! As I'm typing this, I heard a rustling near the back of our truck about 5 feet away. I thought a plastic bag had fallen over, but a second later I heard something else. Ruth had gone to the washroom so I didn't think she was back yet so I went to have a look. And here was this big male baboon trying to get into our stuff! I clapped and jumped and he went running to the front of the truck. I chased him a bit and he kept going back and forth. Anybody watching would have laughed! And I just finished saying how they weren't pests! Today, we are off for six days in Etosha National Park. This is one of the premier wildlife viewing parks in the world and we can't wait to tell you all about it! just be careful of baboons. just got home from work but had to check in to your adventures before going to bed. Be safe and have fun. love that little dik-dik. The site management should sort out your electrical point for you if you ask them. It's possible that they simply have not thrown the switch on their side. 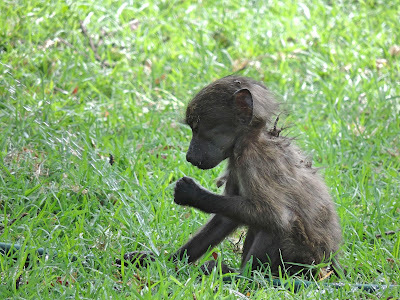 The baboons unfortunately get fed by tourists and lose their fear of humans which does lead to them becoming pests. In extreme cases they become quite belligerent and simply steal directly out of people's hands. They can be aggressive and give a nasty bite if they are provoked, just check out the teeth on the adults! That Dik-Dik is adorable. Was it a baby, or do they just all have that cute little baby face? I hope you won't have any wild animal issues at night while you sleep. What a super adventure, and it's only beginning. Although I've never had a desire to visit Africa, your posts may change my mind! Spectacular view from the Waterberg Plateau, and like everyone else, I agree, that dik-dik is adorable! I am loving this 'virtual' adventure and am especially enjoying the photos and experiences with the wildlife. I know, people do cause their own problems with animals - search, look, enjoy and leave them alone - unless they're getting into your stuff. But, then you just let him know he needed to leave. It probably was a funny sight - Kevin acting like a baboon(?) for the baboon! Keep having lots of fun and I can't wait for the next installment. Really sounds like you are having an awesome time, excellent pictures. Great pictures! This is all very interesting, so much so I have been reading up on Namibia and the continent. So much to see and do. We're glad you won the contest. Oh, we loved the Dik Diks! Can't wait for you to list what you've seen in Etosha (I will be interested in everything from large to small) and maybe a bird or 2? Do try and get a bird book if you haven't, you won't regret it. Have a fantastic time. Etosha is such an amazing place, we love the water holes set in the vast salt pan. Take care with the balloons as they smell.food and things like toothpaste and have been known to break into tents to get them and whilst there they crap all over the place. Best to.keep food and toiletries in sealed containers. I may not comment much, but I'm enjoying your posts. Almost two months in South Africa last year and only met one American, lots of Germans. Mid day always best by the pool. Looks like a nice campground. The baboons are definitely pests in camp and can be quite nasty. Great journey so far. Baboons don't thrill me at all but that Dik-Dik is beyond cute. Wonder why so many Germans head to Africa? It was once a German Colony? Too bad you didn't take a video of the baby baboon and the water hose. View from the top Waterberg Plateau is awesome. In addition, please be careful from the Baboons They have no fear of humans. Enjoy and have great time.